A friend has this 30-some year old flying saucer-like TV antenna that was sitting on their front porch for some time. One day near Halloween 2008, they asked me if there was a way to mount the thing higher to get better reception, so I thought about it for a bit and figured, “sure – you just need a shelf sort of thing”. I went to the Metal Supermarket and picked up some 16 gauge sheet and had at it. The guy at the store told me I was probably over-building it and would be fine with 22 gauge but I thought it needed to be a bit more rigid than that would allow. 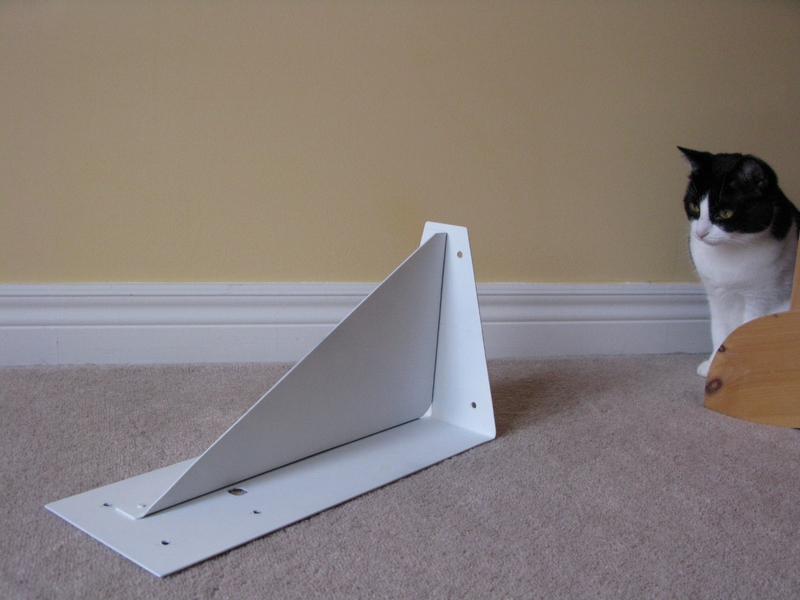 I wish I’d listened – 16 gauge steel sheet is tough to bend without a break! 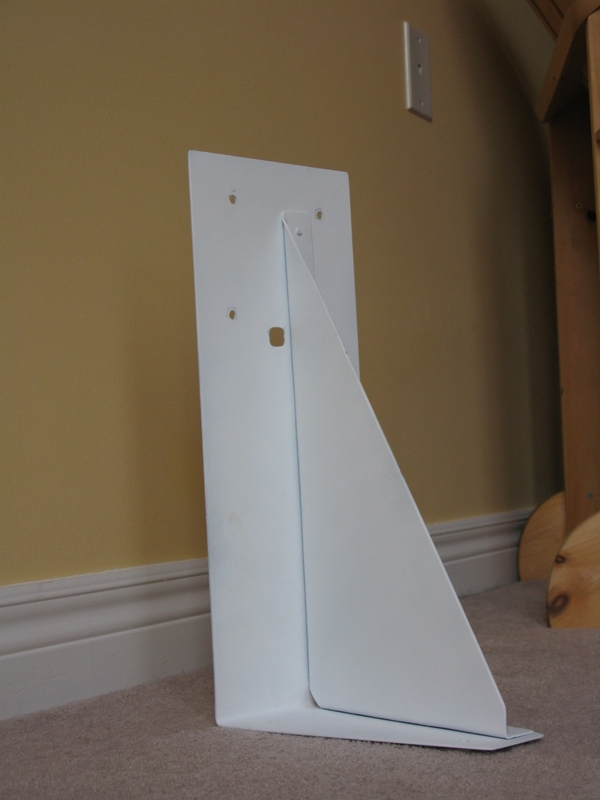 This is basically a steel shelf bracket painted with exterior paint, with holes for the mounting screws on the antenna and a cut-out for the coaxial cable that runs to the TV. I have to say – in the era of digital broadcast TV, the cable companies should be worried! Their antenna works great. They get basic local stations for the Toronto area plus several US stations all in perfect digital quality. It worked so well that I eventually decided to try building an antenna out of coat hangers just to see if it’d work. My TV lacks a digital tuner, so my experience wasn’t quite as good, but it works pretty well. I made mine for less than $10 out of coat hangers and a bit of left-over construction 2×4, and it’s a lot like the one on this website. If you have a digital tuner and you’re not a big tv addict (or hate your local cable provider), you should give it a shot – I think you’ll be surprised how well it works.